We’ll go through them and explain all of the details to make your process smooth and easy. Everything is starting with registration — let’s get acquainted! 3. That’s it — now you have an account on the Crypterium token sale platform. Are you ready to buy some tokens? Let’s move on! Step 2. How much should I pay? How many tokens can I get for my money? If you know the amount of money you want to deposit, but not sure about tokens volume you’ll get — use our internal convertor for fast and easy calculation. You’ll see how much you can spend in any currency and what amount of tokens and bonuses you’ll get depends on day of sales and the number of tokens you want to buy. Please, have a look how our converter works. Easy like ABC. Enter the specific amount of CRPT tokens on the left side of the form. Choose your payment currency: Bitcoin, Litecoin, Bitcoin Cash, Ether Classic, Ether, TetherUSD or USD. That’s it — on the right side you can see the amount you have to pay in chosen currency and down below — your bonuses for purchase. After you calculate how much you should pay for your portion of tokens let’s move to next step — deposit. There are 3 different options to make a deposit. Please note, that depositing funds to your account doesn’t mean the purchase of the CRPT tokens. After the funds are deposited, you need to complete Step 4 to purchase CRPT tokens. If you want to purchase CRPT tokens with any altcoins (no BTC), please note that the price of CRPT tokens would be calculated at the time of actual purchase of the CRPT tokens, not at the time of depositing funds to your account. We’ll use actual rate every time, when you make a purchase. After this go to your wallet/exchange/mining pool account and send funds to this address. Please make sure your deposit equals or exceeds the minimum purchase amount (at the current exchange rate, it is 0.0001 BTC). 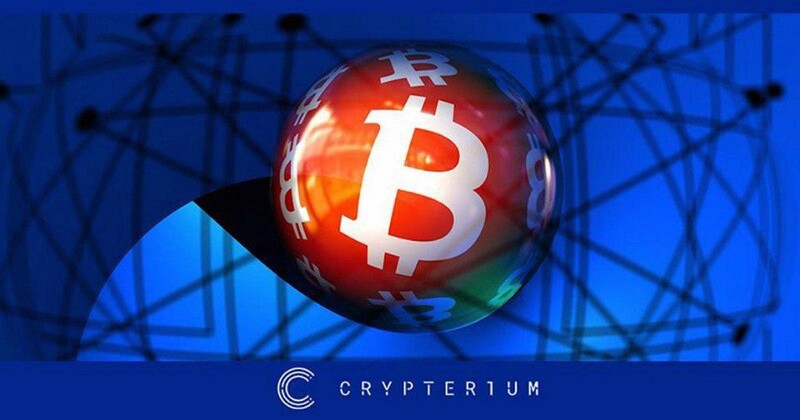 Funds will appear in your Crypterium account only after the transaction gets a few confirmations from the network. This can take from 10 minutes to 2 hours and more, depending on network current load and your transaction fee. If you want to deposit USD to your account, you need to generate an invoice. Minimum amount for this type of transfer is $50. Click Generate invoice button and fill in the fields. Invoice with a unique number and all of the payment information will be sent to your email. You can pay in bank with international or local transfer (USA citizens only). Don’t forget to add “CRPT invoice number” (example: # INV-CRPT-1111) to the payment note. Payment will take a few days to proceed — you can ask about expected payment time in your bank. If you would like to pay with your Visa or MasterCard, note, that it’s a very expensive way to pay. Exchange commission may be up to 25%. We will generate your personal unique BTC address, connected to the Crypterium account. You will send BTC to this address using third party service, Indacoin, with its exchange rate. Note, that you will have the limit of $50 for the first transaction, $100 for the second transaction available after 4 days of the initial purchase and $500 after 7 days of the first transaction. Be prepared to pass Indacoin’s KYC — you will need to verify your identity to proceed payment. Click on the Get Address for payment button. We will generate your BTC address, copy that and click Pay with Visa/MasterCard. We’ll redirect you to the Indacoin site. Fill in the fields — enter amount in USD that you want to spend (or amount in BTC that you want to get). Add your email, phone, date of birth and card number — don’t forget to agree with Terms! Click to the “Buy Bitcoins now” button and your money would be sent! 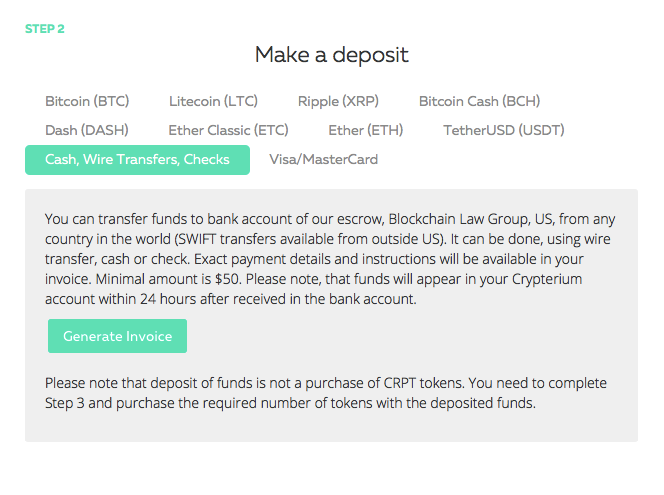 Please note that deposit of funds is not a purchase of CRPT tokens. You need to complete Step 4 and purchase the required number of tokens with the deposited funds. After you made a deposit you can buy tokens — hooray! Just enter the amount that you wanted (or use “Spend all funds” button in your account), check total price and click “Buy now” button. Congratulations! You’re done — now you have CRPT tokens! Tokens will be distributed to your account immediately — this applies to purchased tokens, bonuses for the purchase or deposit. Click on the ‘Set wallet for withdrawal’ on the right-side menu. 2. Enter your email and ETH wallet. Please, make sure, that your wallet support ERC-20. What do you do with tokens? You can withdraw it to your wallet or keep it for some time on your Crypterium account (deadline for withdrawal is a few days after the end of ICO or hardcap). The withdrawal process is automated, but you’ll need to push the button to confirm payment. You will be able to withdraw tokens after we publish our smart contract on blockchain. Date of publishment will be announced later. Have any questions that we hadn’t covered? Ask them in our Telegram chat!